La Centerra has a Santa on Saturdays and Sundays where parents can take pictures of their children (or cats) with Santa. It's nice because you don't have to buy them from some random photographer and can just take the pictures with your own camera. 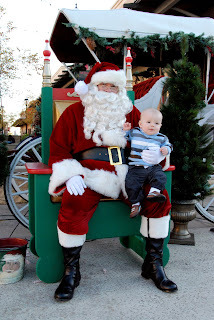 This was Jackson's first time to see Santa, although I did see a Motorcycle Gang of Santas at Target yesterday. They were biking around as Santas and handing out candy canes. If only Jackson had been with me. That would have been the picture. Anyway, Jackson was a little timid and we didn't get any great smiles. 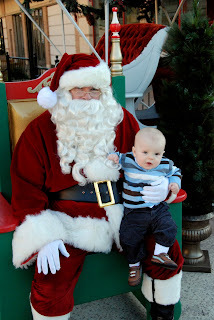 He was fascinated with the beard and the majority of our pictures are with Jackson staring at Santa. In this last picture, Jackson is about to cry and has decided it's time to get down. 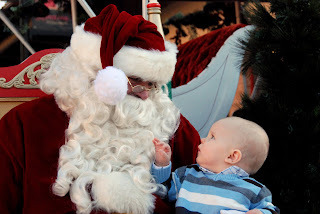 Picture # 2 - Love it when babies look at Santa like that.